He is perhaps best known for portraying Tim Canterbury in “The Office,” Dr. John Watson in “Sherlock,” and Bilbo Baggins in Peter Jackson’s “The Hobbit.” . 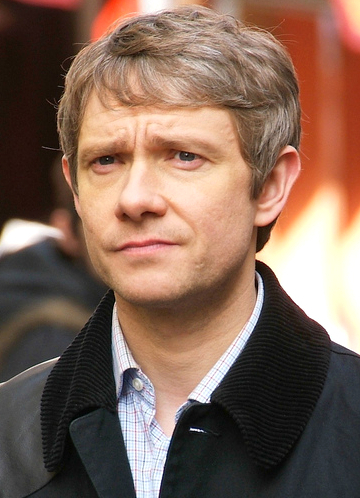 Now Martin Freeman earlier this week was twice nominated for Emmy awards. None of this, though, helped with the NY Times review of Freeman in the title role of “Richard III” in London directed by Jamie Lloyd. Mr. Freeman, who just received Emmy nominations for his performances in“Fargo” and “Sherlock: His Last Vow,” is giving us a Richard who almost disappears before your eyes, even when he’s making orgasmic noises while strangling a victim with a telephone cord. That this is a man to be deeply and truly feared is suggested by all the evidence, except Mr. Freeman’s performance. Here’s the rest of the review.